As Francis drew closer to God through prayer, he began to reach out in compassion to people who were disadvantaged and marginalised. He gave all his possesssions to people in material need and he took care of lepers. More than ever, he sought out quiet places such as abandoned churches around Assisi where he prayed to God in the depths of his heart. 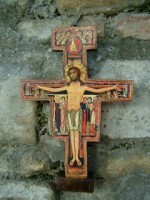 One day as he knelt before the crucifix in the ruined little church of San Damiano below Assisi, and prayed for direction in his life, he seemed to hear the crucified Christ saying to him, "Francis, go and repair my house which as you see is falling into ruin." At first, Francis took this to mean the physical structure but after going and repairing a number of ruined churches around Assisi, it gradually dawned on Francis that God's 'house' is far bigger than church buildings ... God's house is the whole of creation!